Today was the largely anticipated, official release date, of Apple Computer’s newest OS X version 10.4 Tiger. Approaching the store in a somewhat power-walking fashion, I noticed a combination of nervous, anxious, and excited stirred inside me. Our eyes met, I stopped cold and dedicated a moment to admire the apple store in all her beauty. 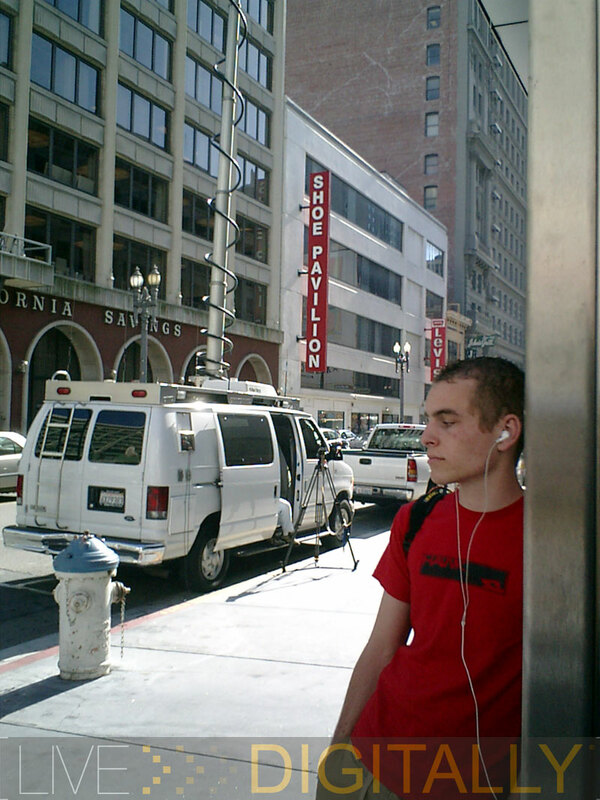 A hoard of people could be seen standing amidst the glass doors behind a green line holder. The masses had beat me there. 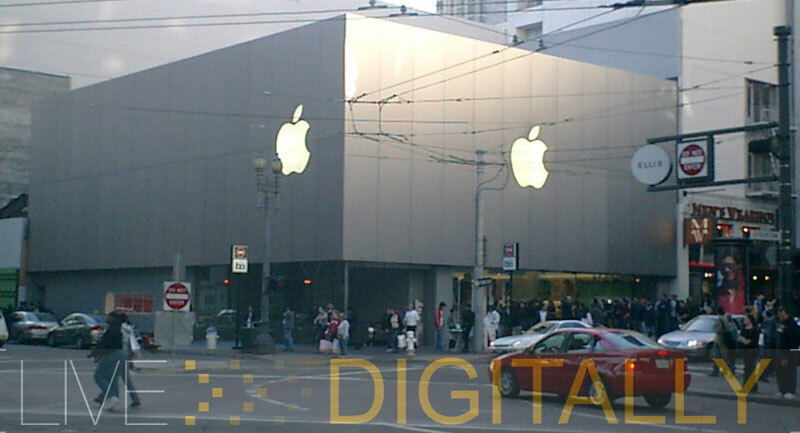 The San Francisco Apple retail store closed its doors promptly at 5pm allowing employees one hour to prepare the venue for a 6:00pm arrival of Tiger. 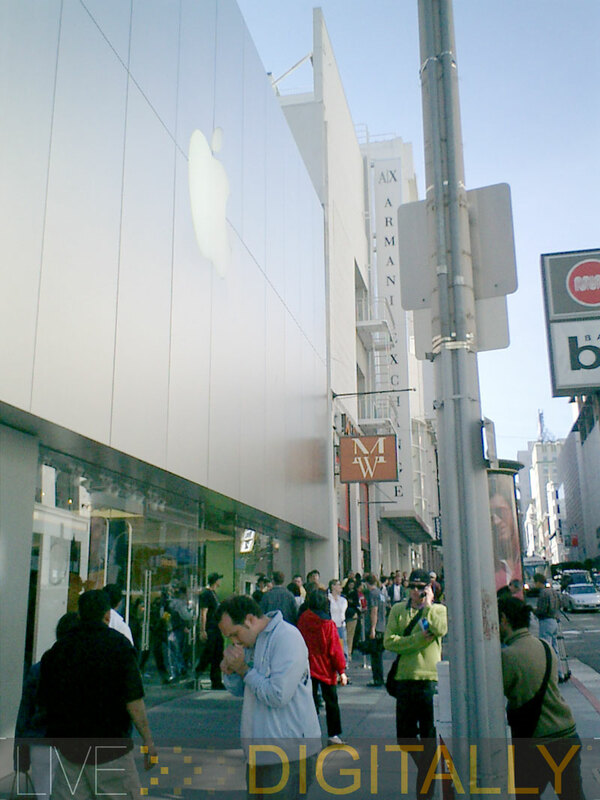 I showed my face in downtown San Francisco at 5:00pm to find a line of approximately 100 Mac fans patiently awaiting their entrance go-ahead. The first person in line had smiles all the way, with “only one more short hour to go” written on his face. After a small chat with him I found out that he only used Macintosh computers (G4 at home and G5 for work), and arrived at 4:00pm to get his hands on the black box where X marked the spot. The local news had shown up to cover the momentous Apple event. The temptation was irresistible to take a picture of a news van while a curious pedestrian displayed his signature Apple white earbud headphones. 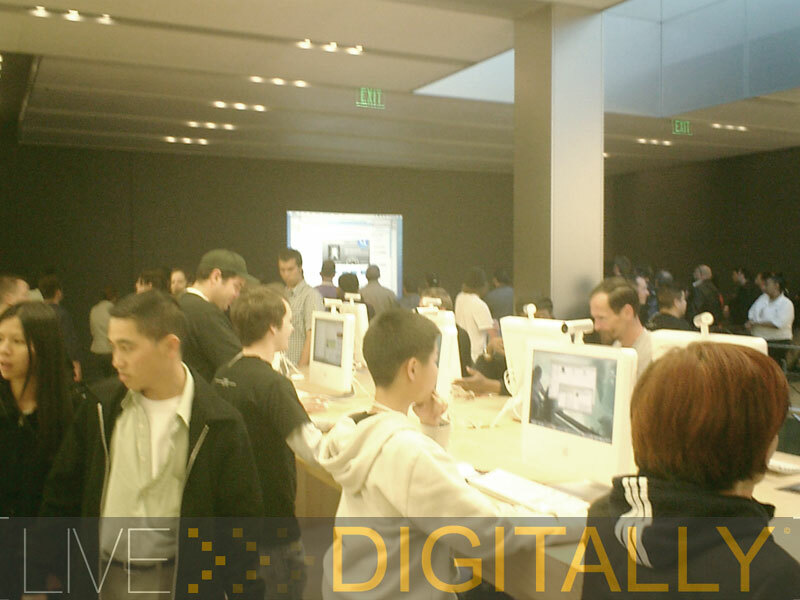 Signs of Tiger’s arrival littered the Apple store internals. Employees dressed in fresh new black shirts with different Tiger themed logos and phrases. The store was a bit empty as most people were waiting outside of the building. Staff members appeared tense yet amped as the countdown continued. I scouted out the scene for a few minutes, overheard talk of G4’s, Powerbooks, Mac Mini’s, iPods etc, and contemplated standing in line or getting a sub sandwich. The sub sandwich idea triumphed with heavy influence from my lack of lunch. Apple store, “I’ll be back” (in the memorable Arnold voice). The line was still existent and the store buzzed like a bee hive. I jumped to the back of the line at 7pm, and found myself in the store at 7:05pm. Upon entrance I was given a scratch and win business card piece of paper. “Scratch and Win! Win a Powerbook G4, and iPod, or other prizes”. I won a free iTunes song. A few Spotlight searches, Automater personalized task setups, and of course the fun Dashboard widgets and I too was a Tiger guru. He said that he had a few hours experience with the operating system and most of the new changes were very intuitive, hence little to no learning curve. I was extremely impressed by the sleek feel of the new OS. Having only about 10 minutes of actual interaction with the Tiger hooked me. I predict entire near future days dedicated to this new bit of software. Upstairs I jamed to Daft Punk and listened to a projection presentation displaying many of the more subtle features of OS X 10.4. Swimming through crowds of Apple fans later dumped me at a shelf stacked with the reason for my visit. Tiger, OS X, 10.4, the new holy grail for Mac users world wide. To no surprise, the box resembled Apple’s website dedicated to the 4th version of OS X. By 7:25pm the line was no more, and happy customers walked straight into the store with wide eyes and illuminated faces. Apple Items I Can’t Live Without: The entire store, 700 or so? Impressive New Operating Systems: One, Very Impressive.